The Ramblers was a Dutch swing band that made its first recordings in 1929 and lasted until the mid-1950s. It is perhaps best known for accompanying Coleman Hawkins on some classic recordings when he lived overseas in the mid-to-late 1930s. Somehow the group not only continued performing during the Nazi occupation years but made records during those dark years, using Dutch names for the songs even when the tune was based on an American swing standard. In 1945 the Ramblers emerged from World War II. at the peak of its power. It had grown from a nonet to a 16-piece swing orchestra. 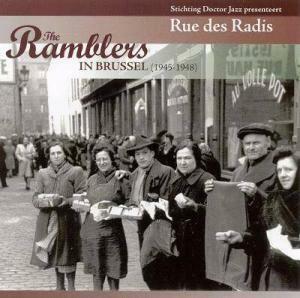 The Ramblers In Brussel (1945-1948) [sic] is a CD put out by the Dutch Doctor Jazz magazine. While its extensive liner notes are in Dutch, there are excellent photos throughout the CD’s booklet, the personnel and song titles are easy to read, and there is no language barrier to the music. None of the names of the musicians (other than Francis Bay, a future swing bandleader who plays trombone on one song) will be known to today’s listeners. However the musicianship is high-quality, the ensembles are tight and swinging, the solos are colorful, and the six vocals (from three different vocalists) are in English. Such familiar songs as “Dinah,” “You Made Me Love You,” “Candy” and “My Melancholy Baby” are given fresh arrangements while the lesser-known songs (which include some riff-filled blues) swing well. The influence of the new bop music is just slightly felt on one song in the arrangement but otherwise this is classic swing. The Ramblers could hold their own with other American big bands of the period and their consistent enthusiasm is often irresistible.